HARRISBURG – Last weekend, Rep. 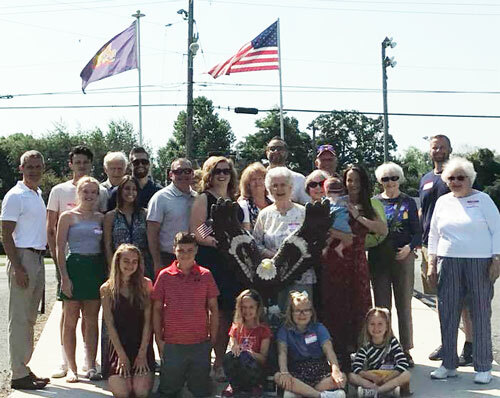 Rob Kauffman (R-Franklin) participated in a ceremony renaming a bridge on a portion of State Route 1004 over the Conococheague Creek in Greene Township as the Private Charles W. “Bill” Roher Memorial Bridge. Roher was a native of Chambersburg and served in the United States Army from April 1943 to March 1945. Roher honorably served his country with the 17th Airborne Division, Company C, 194th Glider Infantry. This dedication was made possible through legislative language Kauffman drafted that was included in Senate Bill 894 and signed into law on Feb. 15. Rep. Rob Kauffman (R-Franklin) introduced language that was signed into law to rename a bridge on a portion of State Route 1004 over the Conococheague Creek in Greene Township as the Private Charles W. “Bill” Roher Memorial Bridge. Kauffman is pictured with Roher’s family during the bridge dedication ceremony held last Saturday, July 14.